Saturday October 19th 1895 I looked after the dinner some. Ida was in bed all day but her Mother and Aunt took care of her. I helped some about putting things to rights in the house. There were not so many in today. We came home to stay all night. Will had been out in the morning. We stopped to get him a new overcoat. Weather quite cold. Sunday October 20th 1895 It was slightly cloudy in the morning but cleared away and the weather was fine. Will and I went down about ten oclock to get the [Mimy?] girls. After an early dinner we got ourselves ready for the funeral service at two oclock. Dr. Barrett officiated. Oh how sad to think that only one week ago at the very hour Charles went to ride with Mother and now we must put him away where we can never see him again. I cannot realize it. When we got back home the girls had the house all in order and supper ready. We brought them over and came on out home. Miss Luse and the boys were just eating supper. I was nearly sick with headache. 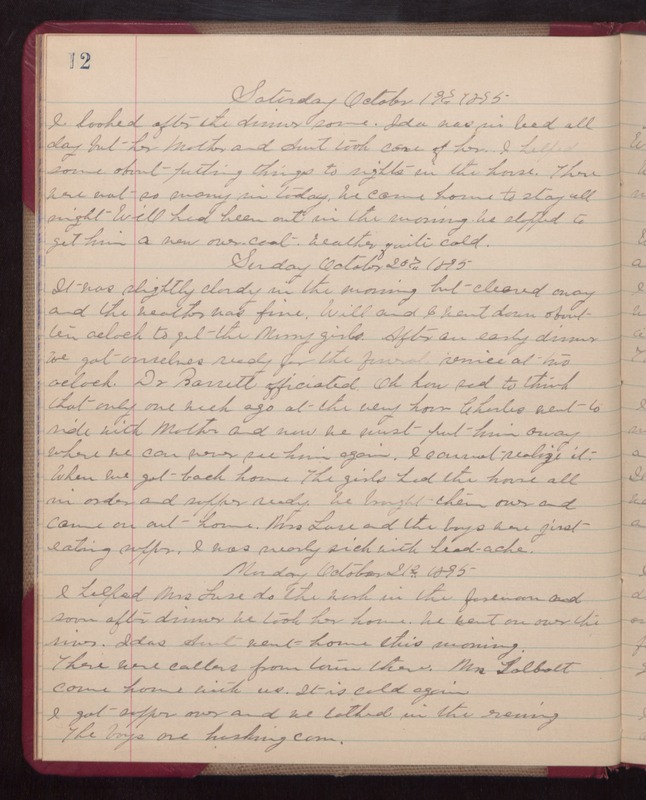 Monday October 21st 1895 I helped Mrs. Luse do the work in the forenoon and some after dinner. We took her home. We went on over the river. Idas Aunt went home this morning. There were callers from town there. Mrs. Talbott came home with us. It is cold again. I got supper over and we bathed in the evening. The boys are husking corn.